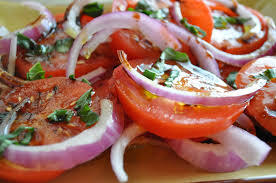 The sweetness of the grilled onions brings out the sweetness of the tomato. This recipe can be broken down as a hamburg or steak condiment by just using the seasoned grilled onions only. 2) Preheat grill to medium-high and grill about 5 minutes on each side or until golden brown. Remove from the grill and cool. 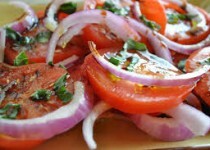 3) Slice tomatoes into thick slices. Season with salt and pepper. Drizzle with remaining olive oil. Top with the onion rounds.